“Life’s greatest joy is to scatter your enemies and drive them before you. To see their cities reduced to ashes. To see those who love them shrouded and in tears, and to then gather to your bosom their wives and daughters” – Genghis Khan. Genghis Khan (1162 – 1227) gathered to his bosom many of his conquered enemies’ wives and daughters: a 2003 study revealed that about 38 million people, or 1 in 200 of the world’s population, are his descendants. The founder of the Mongol Empire, the world’s largest contiguous empire, he was one of history’s most terrifying figures. 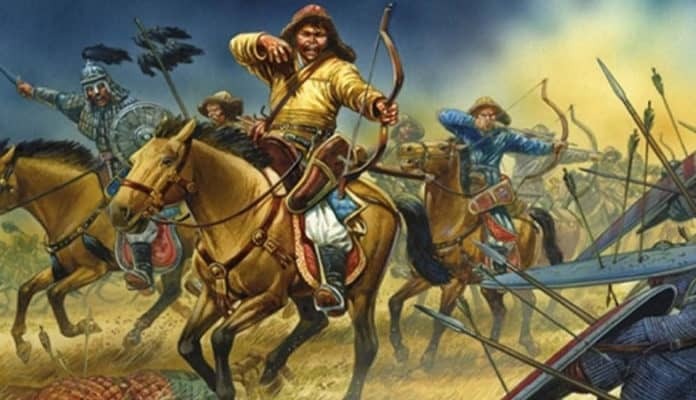 The estimated 40 million deaths toll of the Mongol conquests he initiated, viewed as a percentage of the world’s population in his day, would be equivalent to 278 million deaths if adjusted for the 20th century. Extrapolated to the modern era, his victims would have been about four to six times greater than those of Hitler, Stalin, and Mao, combined. Following are 40 historical facts about Genghis Khan and his Mongols. Genghis Khan and his Mongols were born and raised in the Eurasian Steppe, a plains region stretching from Manchuria in the east, to Hungary and Croatia in the west. A harsh land of scorching summers and extreme winters, the Steppe’s saving grace was its abundant grasslands, which allowed the raising of vast herds of livestock. As a result, the region was inhabited for millennia by nomadic tribes, who wandered with their herds from pasturage to pasturage. The nomads often traded with their neighbors in the settled lands surrounding the Steppe, but whenever opportune, they were just as comfortable raiding them.